Aliman Bio | METAPHYSICS LIVE ! Aliman Sears was born in 1961 in Detroit, Michigan. He worked various entry-level jobs in the 1970’s and in 1983 he entered the US Army. Throughout the 1980’s he was a student of the New Age, Human Potential and Self-Help movements. He studied religion, mysticism, history, transpersonal psychology, and philosophy. His Army enlistment ended in 1986, and in that same year he had an awakening when he was initiated into a spontaneous, moving meditation. Over the next 25 years this bodily experience of the larger universe slowly changed the way he thought about reality. In 1999 he earned a master’s in Philosophy with a focus on Process philosophy and philosophy of science; he also holds a Master’s degree in psychology. He has worked for public and private human services providers on the US mainland and in Hawaii since 1989, and has been involved in psychiatric social work since 2000. He has worked with various populations and has held positions from direct service provision to statewide program implementation and management. Since 2000 he has been a member of the Adjunct Teaching Faculties of TransPacific Hawaii College and Chaminade University in Honolulu, where he teaches Philosophy, Ethics, and Critical Thinking. In 2004 he was among the first candidates ever in Hawaii to receive the CPRP (Certified Psychiatric Rehabilitation Practitioner) awarded by USPRA (the United States Psychiatric Rehabilitation Association). Because of his earlier study in the Human Potential and Self-Help movements he gained insight into the Recovery Model as it relates to persons diagnosed with mental illness. 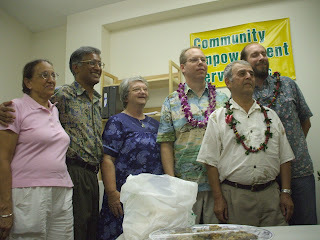 For this reason, and for his work in placing the mentally ill in jobs, he is also recognized as an expert in the arena of Supported Employment for the mentally ill.
2000 to 2006 he ran the largest ACT (Assertive Community Treatment) teams in the history of the state of Hawaii, and managed a statewide Supported Employment program for the mentally ill. He is currently co-founder and Chief Operating Officer of Community Empowerment Resources, in Honolulu, a private nonprofit which provides case management and psychosocial rehabilitation services to the mentally ill homeless population on the island of Oahu.